NEW DELHI: India’s Gen Z, a key swing constituency in the 2019 general elections, has a simple message for politicians: more jobs, please. As many as 13 crore first-time voters — more than the population of Japan — will be eligible to vote in next year’s general elections. A key issue for this electorate is Prime Minister Narendra Modi’s failure to deliver on his promise of creating 1 crore jobs a year — a pledge that won him the hearts of India’s youth in the 2014 election. Yet with barely eight months to go to national polls, voters who believe job creation is Modi’s biggest failure have risen to 29 per cent from 22 per cent in January 2018, a recent survey found. Employment is the prime concern of young Indians, according to a 2016 survey of more than 6,100 respondents by the Centre for the Study of Developing Societies (CSDS) and Konrad Adenauer Stiftung. When asked to nominate the most important issue facing India, 18 per cent said jobs and unemployment, about 12 per cent said economic inequality and 9 per cent said corruption. In the absence of timely data, it’s impossible to estimate the number of jobs created during Modi’s term in government. Still, his administration is highlighting its efforts to provide youths with skill training and loans and encourage startups. Latest figures from the Centre for Monitoring Indian Economy (CMIE) shows the unemployment rate in August was 6.32 per cent — the highest in at least a year. Rajat Shukla is desperate. It’s been more than a year since he began searching for a job and although he’s prepared to accept a position well below his qualifications, the outlook is bleak. His typical day includes scanning newspapers for vacancies, running to placement agencies and attending interviews. The main opposition Congress party is moving to cash in on the disenchantment over unemployment and rising social tensions. 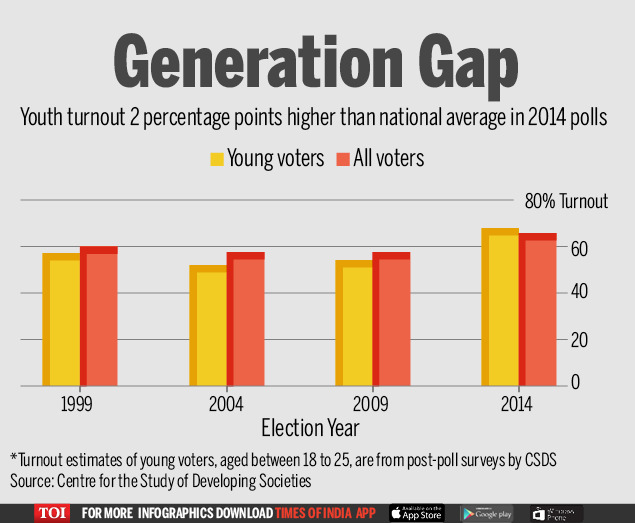 Voter turnout in the 18-to-25 years age group was 68 per cent in 2014 — two percentage points higher than the national average, said Sanjay Kumar, director of the New Delhi-based Centre for the Study of Developing Societies, noting this was expected to remain stable in 2019. High unemployment is also seen as a one of the key factors driving rising social tensions, risking Modi’s reputation as an investor darling. A recent incident of mob vanadalism by mostly young Hindu pilgrims in north India prompted industrialist Anand Mahindra to call it “dictatorship by mobs” that showed the “disastrous” side of the nation’s demographic dividend. “A large number of unemployed youth would indeed be a source of concern,” said Pravin Krishna, a professor at Johns Hopkins University. A glimpse into just how dire the job market is came in March, when the government announced 90,000 vacancies at the state-run Indian Railways, the nation’s biggest civilian employer. A staggering 2.8 crore people applied.